Brooklyn-cased creamery Ample Hills is known for their inventive and delicious flavors of ice cream. Even non-New Yorkers might be familiar with some of their more popular flavors, like The Munchies, Salted Crack Caramel, and more recently, their Star Wars-inspired flavors. The creamery is going to be at The Village Voice’s upcoming Choice Eats event on March 11, so we called up their art director Lauren Kaelin to find out how Ample Hills comes up with their famously crazy flavors. In their five years of operation, Ample Hills has churned out about 500 different flavors of ice cream. Inspiration for the flavors can come from many different places—even simple things like the view from outside. Each Ample Hills location has its own signature flavor based on the neighborhood it’s located in. The Gowanus location has a flavor inspired by its infamously sludgy canal (called It Came From Gowanus). The custom creation features dark chocolate with “mysterious elements lurking within the chocolate.” It also has little white chocolate pearls to honor the oysters that used to reside in the canal. A lot of inspiration also comes from pop culture, like television and movies. Last year, Ample Hills released a flavor called One More For The Road, in honor of the Mad Men series finale. The flavor was an ice cream spin on the Manhattan cocktail. It contained a sweet cream base with Canadian Club whisky (Don Draper’s favorite) and pieces of glazed orange peel for garnish. More recently, Ample Hills released an X-Files-themed flavor called The Scoop Is Out There. “We called on our fans on social media to name and design a flavor,” Kaelin said. “Then we pulled elements from different ones and created an X-Files flavor.” The paranormal green pistachio ice cream came with chocolate-covered sunflower seeds for Fox Mulder and chocolate microchips for Scully. The pints had stickers on them that were inspired by the “I Want To Believe” poster in Mulder’s office. Fun elements like that are considered part of the flavor-making process. In December, Ample Hills celebrated the new Star Wars movie with two new flavors that came in collectible pint containers. They even worked with Lucasfilm to design them. Aside from television and movies, Ample Hills has also been inspired by politics. Each presidential election cycle, the creamery pays tribute to candidates with a special flavor. Last election, Mitt Romney got a flavor called Mitt Rom Raisin. 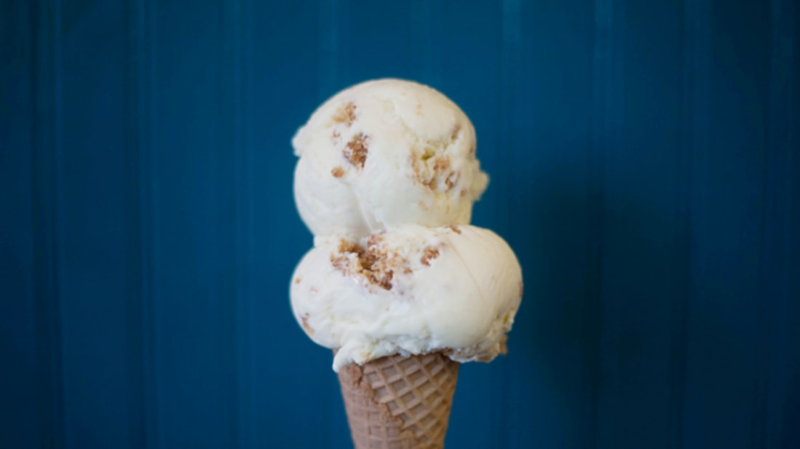 Obama’s flavor was based off the White House’s microbrewery and honey bee colony, with a sweet cream base, Ommegang Witte beer ice cream, and homemade honeycomb. “Beer and ice cream go really, really well together,” Kaelin said. Still, sometimes the combinations fall a little flat. Kaelin’s least favorite flavor was an ambitious savory-sweet concoction called Beer Munchies. The flavor was meant to be a more intense, boozy spin on their popular flavor, The Munchies: Pretzel-infused ice cream with assorted junk food like Ritz crackers, potato chips, pretzels, and mini M&Ms. Even when a flavor is retired, it’s not forgotten; often flavors will be re-imagined or repurposed and find new life as another flavor. For example, Kaelin mentions a flavor called Hundred Acre Woods, which was inspired by Winnie the Pooh. The popular flavor had gummy bears and honeycombs in it to honor the yellow bear and his favorite food. While enjoyed by most, the gummy bears tended to get too hard when frozen, leaving some customers to say they'd prefer the flavor without the candy. In response, Ample Hills released a new flavor called Sweet As Honey, which ditched the bears. “That has been on our menu as a staple now for years,” Kaelin said. Sweet As Honey will be featured at Choice Eats, along with Salted Crack Caramel and Snap, Mallow, Pop—an ice cream spin on the Rice Krispie Treat. "[Snap, Mallow, Pop] is amazing because it has that gummy consistency that you love about marshmallows because it is just marshmallows." Looking forward, Kaelin said Ample Hills is experimenting with some more cookie dough flavors. They're also tinkering with a raspberry champagne sorbet.